I'm a huge fan of the super easy, requires little clean up dinners. Aren't you? As a food blogger, I'll admit, I love to experiment with flavors and try new adventurous techniques. But, I'm a mom. I work full time. I'm exhausted 99% of the time. I absolutely hate..HATE doing dishes and cleaning up. So when there's a meal that saves me time, requires minimal cleanup, but is a delicious homemade meal I'm all for it. 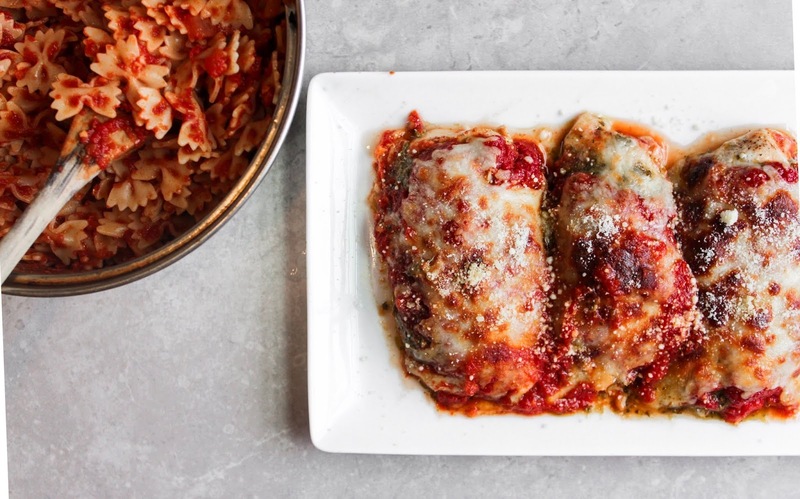 This recipe is a fun twist on the traditional chicken parm. Who doesn't love chicken parm?! Ok...I do love chicken parm but it does get a bit...boring? Maybe a little predictable? Add a generous layer of pesto underneath the tomato sauce and cheese and you'll have a dinner that's not at all boring or predictable. And since there's no chopping, no slicing and no dicing you can have dinner on the table without breaking a sweat. I'll also add this was kid approved. Miss Lilly loved this! I take off the melted Mozzarella before I feed her since that can get a little stringy and I'm not comfortable with her ability to chew that. But she loved the pesto tomato chicken, so a meal that works for mommy, daddy, and Lilly is a winner in my book. So the recipe below lists out the ingredients you need, but some of the quantities can be up to you...there's no right or wrong here...another reason to love this recipe! If you're a huge pesto fan go ahead and add more! 1. Heat oven to 350. Lay the butterflied chicken breasts in a baking dish, drizzle with some EVOO and season with salt and pepper. Generously cover each chicken piece with pesto, then with tomato sauce (again, generously), and lastly the Mozzarella cheese. bake for 27-30 minutes until chicken is cooked. Place under the broiler for a few minutes to brown the cheese (always watch the food when it's under the broiler, things can burn very quickly!). 2. Top with grated Parmesan cheese and serve with a side of pasta.